It seems most of the time my fotos are of the same old thing, but I guess that's because they're of something that brings me so much joy. I love being outside! Our temps have been in the 90's this week and it's way too hot to work outdoors unless it's first thing in the mornings. I always love your photos. 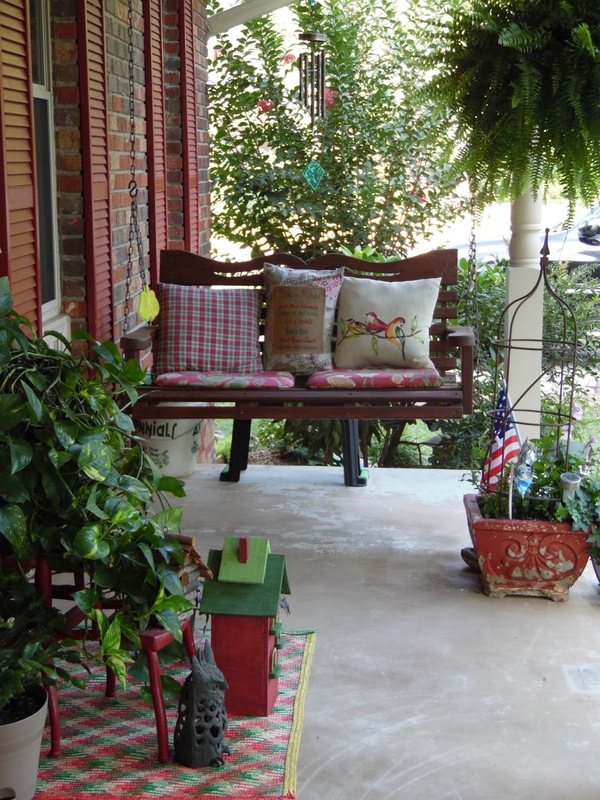 Your porch looks like a good place to curl up with a book. It's really hot here too. I took the dog out a few minutes ago and the air is just so muggy. Even my glasses steamed up some and it was only about 5:30am. Your flowers are beautiful and so is your front porch. So pretty. I like your bird house and flag too. I hope it will cool down some soon for you so you can be outside and enjoy them. 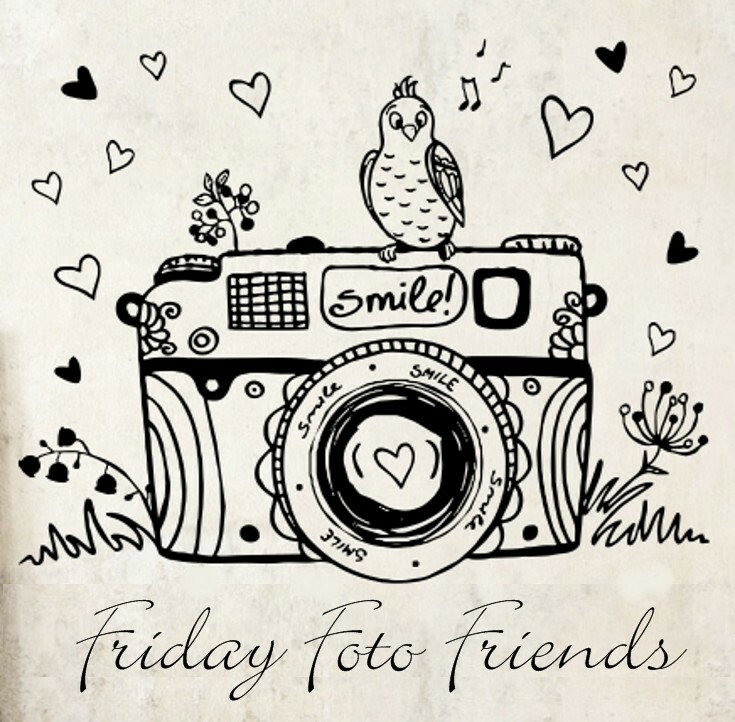 What beautiful photo's you have this week,Debbie. Love your porch, sure would love to sit and have Tea or Coffee with you there! Enjoyed seeing your new garden, and all the beautiful bright flowers. Also I know you enjoy your happy place on the porch when the temps are not quite as hot as these days. We are porch sitters! Happy Friday. Nice blog. You may also have a glimpse at this source. I LOVE your porch and the swing...and your lovely new garden. The flowers are superb, and your little garden flags are so perfect. Your home looks very inviting and peaceful. Thank you for sharing it with us this morning. I feel like I am sitting there with you, enjoying our morning coffee/tea, and sharing what the Lord has done! What a beautiful way to start the day! May I come sit on your porch? It is so cute and inviting. Everything looks so pretty Deb, your hard work shows!! I just love your new flower bed. The flowers that you posted are so beautiful and vibrant! Your front porch looks so cozy for those lazy summer days. Keep cool. it was 99 here along the Jersey coast yesterday and in the 90s again today with high humidity. I love your porch. It is so pretty. I won't get tired of your outdoor photos :). Love them. A little on the warm side today but nothing unbearable. It is summer after all. We don't even use our AC. Your porch would be my happy place too. If I could get out of the heat. We have been known to run a fan outside so we can enjoy the out of doors and no so much of the heat. Gardens are my happy place too. Lovely photos. Hi-ya. I read a comment from you on another blog in which you said you love to have new readers, so I figured I'd pop over and sign on as a new groupie to make you happy. HA! I was thinking you'd have a wee handful of followers, and here you have like a bazillion of 'em! Okay, I may get lost in the crowd, but I'll still sign on. It's very nice to meet you. Your garden is gorgeous. I always start out with good intentions, but it doesn't take long for the reality of heat and bugs to send me back inside. I'm in the Atlanta area, and yep, it's been beastly hot here, too. Thanks for such a warm welcome, Debbie! :) Like others have commented, I'm really taken with your front porch. 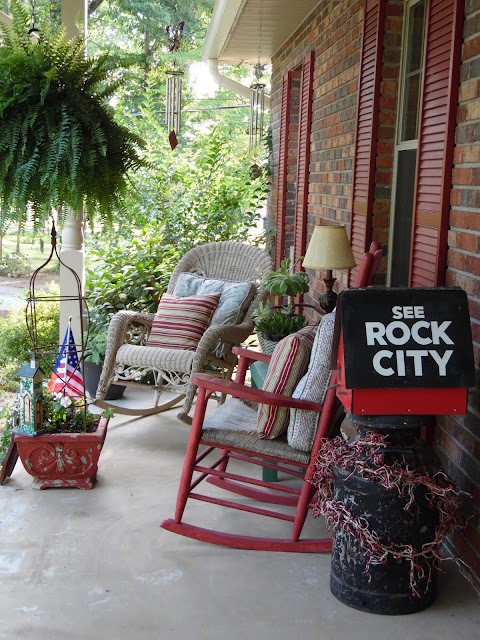 We're in the long-distance 'looking' phase at real estate nearer my son (Alabama) ... and I'm instinctively drawn to anything with a sweet porch that invites someone to pull out their rocker! Phoenix is going through it's annual monsoon season - quite a departure from last month's 110-117 degree days, but the accompanying humidity's something else again! Like Susan (above) jus' said, consider me your newest groupie. She's a real hoot and a great author, too! I forgot to post my link again! Work has been crazy. My life is about to settle down though! :) Love you photos and your front porch looks so inviting. I would love to join you there! 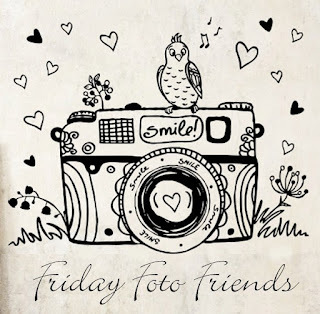 There's nothing wrong with having favorite things to photograph and blog about! Each new view of the 'same' things are new to us and we have looked at lots of stuff since the last time we were here--that makes them wonderfully fresh to us :) I'd love to have your porch, but then I'd love to have some warm weather now, too! Good thing our winter isn't terrible! As your newest fan and contributor, I must say you have created the most lovely, peaceful and fun area that envelops your home... I love the vivacity yet the comfortable personality of your porch and the gardens and flowers are exquisite.. We have to work triple time to keep our gardens watered this season.... I wish my flowers looked like yours.. Just gorgeous!